With the 918 Spyder, the Panamera S E-Hybrid and the Cayenne S E-Hybrid, Porsche was the first car manufacturer in the world to offer three plug-in hybrid models. Among the suppliers Porsche relies on for the innovative drive system is Bosch. 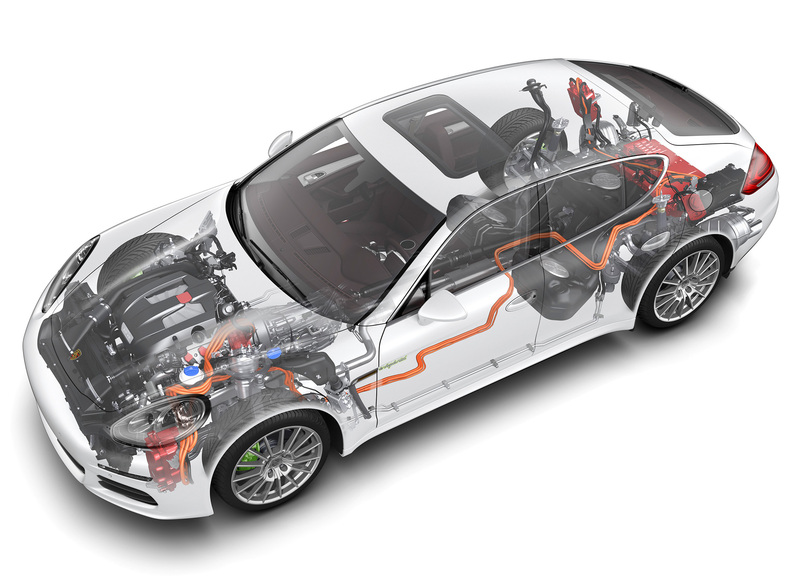 The possibilities offered by the combination of an internal combustion engine and an electric motor will impressively be demonstrated by the Porsche hybrid vehicles at the 62nd International Automotive Press Briefing at the Boxberg test track, starting May 19. 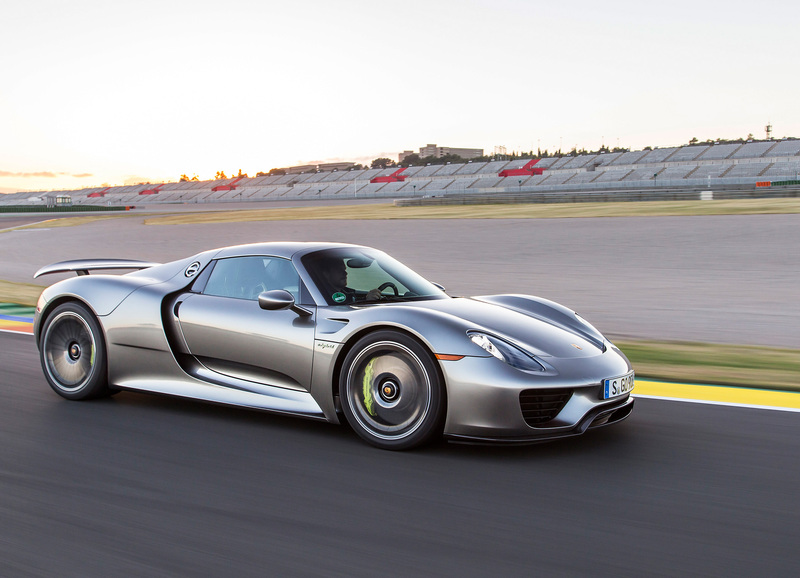 “We promised to redefine driving pleasure, efficiency and performance with the 918 Spyder. We kept our word, and in so doing repositioned hybrid technology”, says Wolfgang Hatz, Member of the Executive Board – Research and Development at Porsche AG. The Porsche 918 Spyder1) was the first globally road-legal car to complete the 20.6 kilometre lap of the North Loop of the Nürburgring in less than seven minutes. At exactly six minutes and 57 seconds, this super sports car with plug-in hybrid drive beat the existing record by 14 seconds. 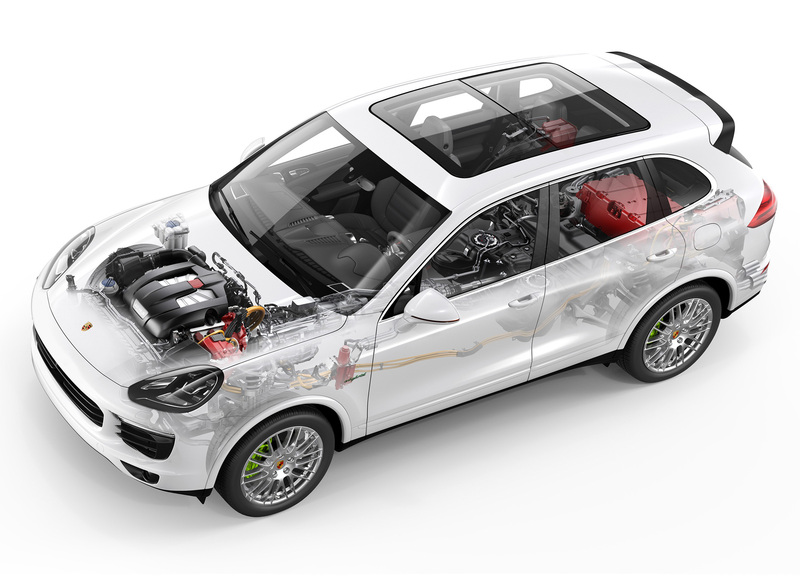 Porsche also integrated the knowledge gained from the develop-ment of the technology demonstrator into the electrification of the rest of its model range. The Panamera S E-Hybrid2) and Cayenne S E-Hybrid3) round off the product range and make Porsche the global market leader for hybrid cars in the premium segment. The project definition for the 918 Spyder’s development team was to build the super sports car for the next decade with a highly efficient and high performance hybrid drive. The completely new development, which logically started from scratch on a blank piece of paper, allows a new concept without having to make any concessions. The whole car was designed around the hybrid drive. 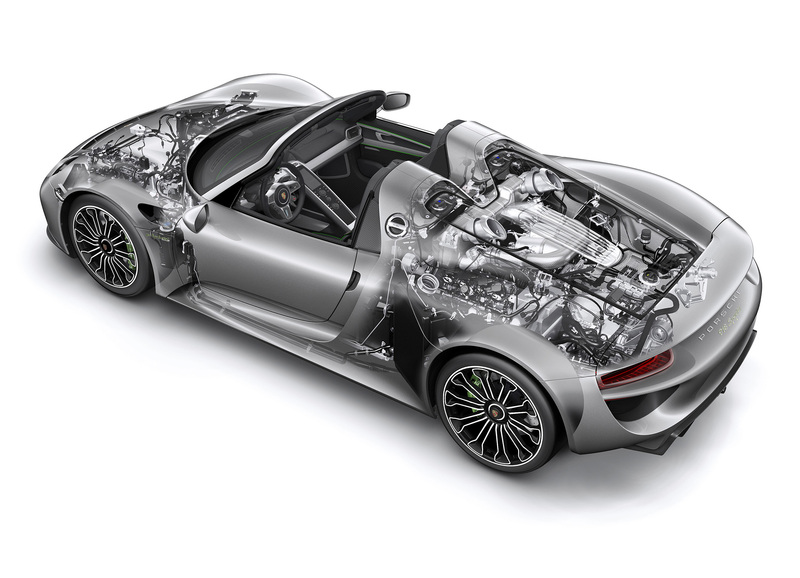 The 918 Spyder thus highlights the potential of hybrid drives, i.e. the simultaneous increase in efficiency and performance, without one coming at the expense of the other. Thanks to the SMG 180/120 electric motor developed by Bosch, the Porsche 918 Spyder has an additional 210 kW (286 hp) of driving power. 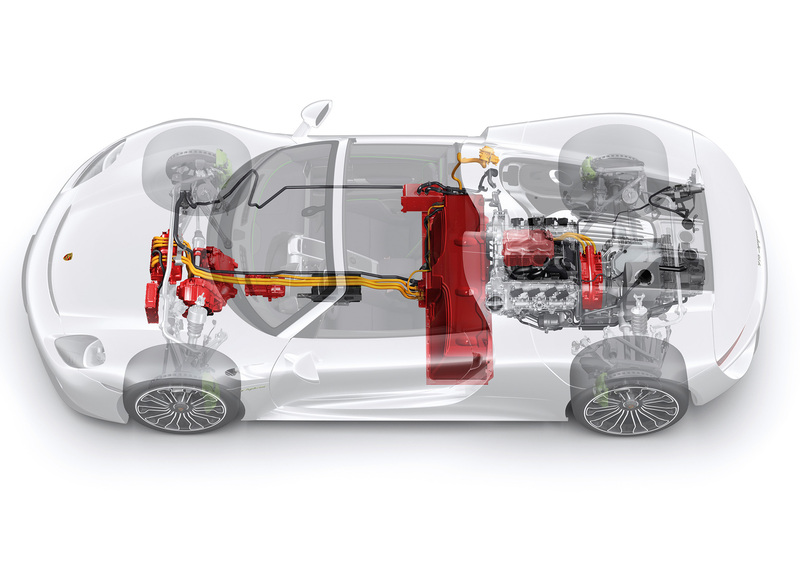 The electric motor on the front axle of the 918 Spyder delivers a torque of 210 Nm right from the start, while the motor on the rear axle delivers 375 Nm. The result is a total system output of 652 kW (887 hp) with a maximum torque of up to 1,280 Nm, allowing the 918 Spyder to accelerate from 0 to 100 km/h in a mere 2.6 seconds. The super sports car’s fuel consumption, on the other hand, is an amazing 3.1 litres per 100 km, making it more efficient in the NEDC test than most of today’s small cars.